I have always loved The Riddler from the Batman comics. I did him once before in ’95 but it was a store-bought Batman Forever costume-not that great. This is a version of his outfit seen in the comics from time to time and I have also seen this on online Halloween costumes. He has a wide variety of outfits using green, purple and black, mostly with the question marks bowler hat and cane being the real staples. Green blazer was found in the Salvation Army Women’s Suits section for about $10 and I had a tailor take it in for me for about $10 bucks. Finding this blazer was a stroke of luck since most men’s suits use much muted colors. The women’s section at the Salvation Army proved very useful and cost-effective. The hat was a yellow bowler from Party City for about $5 spray-painted green with a $3 can. 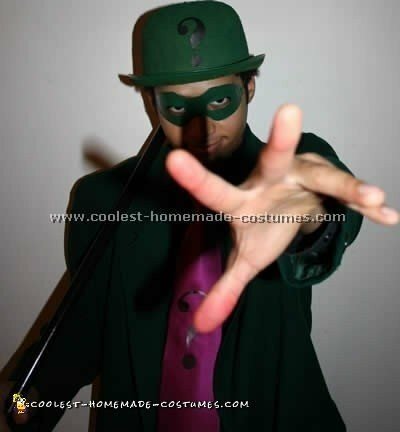 The cane was a white-tipped magician’s cane from Party City for about $7 and the tips were painted green using home art supplies. The mask was a $.99 domino mask also from Party City spray-painted and cut to shape. Last item is a purple silk tie from Wal-Mart for about $8. I printed out question marks on black cardboard and crazy-glued them to the hat and tie, put on a black collar shirt and pants and that’s that! My three year old wanted to be Batman and have his twin brothers who were eight months old to be “the bad guys”. 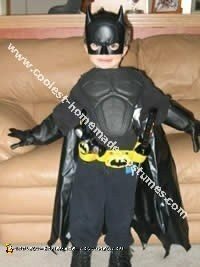 The Batman costume was basically his batman mask (which he uses year round), black sweats black, shirt and black cape. 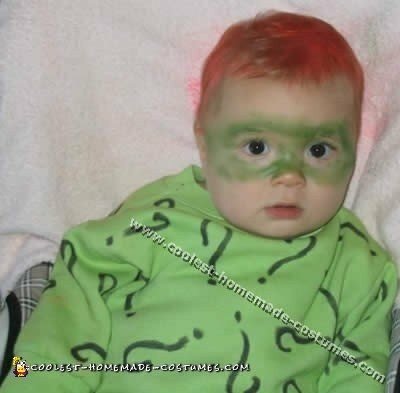 The “Riddler” costume was made by purchasing a white fleece one-piece romper. I dyed that light green and then drew question marks on it with a black fabric marker. We sprayed his hair red and drew on the mask with make-up since we knew he wouldn’t leave a mask on. 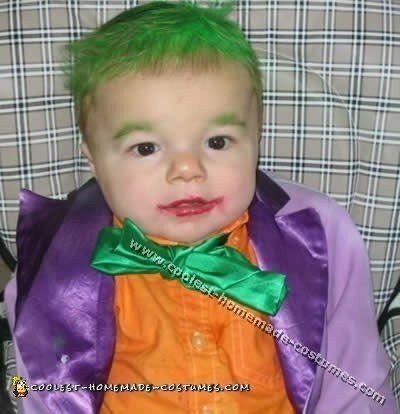 The “Joker” costume was made by me buying a white tuxedo at a resale shop and dying it purple. I bought a white button down shirt and dyed that orange and bought a green satin piece of material from a fabric store for his tie. We sprayed his hair green and darkened his eyebrows with green make-up and put a bit of lipstick on him as well. The boys won a costume contest in our town for these costumes and I have given numerous people the suggestions for them. They were really cute. Thanks for all the great online Halloween costumes!